First ladies – i.e. the wives of the US Presidents – play a key role in American politics and society. First Ladies dedicate their time and energy to social causes and support their husbands’ campaigns and presidency by addressing the nation in different occasions. Michelle Obama – married to the 44th US President Barack Obama – was the first African-American First Lady and played a pivotal role in her husband’s career and success. Michelle stood by her spouse in all occasions while also working as advocate for poverty awareness, healthy eating, education and physical activity. Michelle worked to improve the quality of food in American schools and supported Obama’s and the Democrat’s cause in all her actions. Melania Trump – married to the 45th US President Donald Trump – is the current First Lady of the United States. Of Slovenian origins, she worked as fashion model before marrying the American tycoon in 2005. Michelle and Melania have two very different personalities and play (or played) different roles in their husbands’ lives. While Michelle always strongly endorsed Barack’s actions and views, Melania has been less outspoken about Donald’s political career and has been less involved in his activities. Born in 1964, Michelle LaVaughn Robinson Obama is married to the 44th US President Barack Obama and served as US Firs Lady from 2009 to 2017, during the two terms of Barack’s presidency. Michelle Obama is also a lawyer and university administrator. She played a key role in shaping her husband’s image before the nation, and has become a role model for young women all over America and the world. 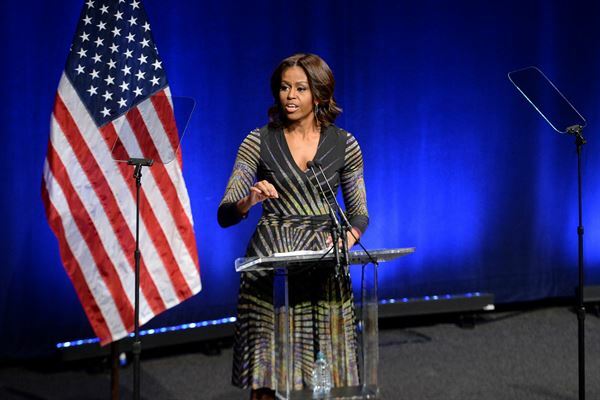 In addition to promoting an empowering feminist message in all instances, Michelle worked as an advocate for poverty awareness and focused on the importance of healthy eating, education and nutrition. One of her main goals and achievements has been improving the quality of food served in American schools in an effort to tackle child obesity all over the country. Often appreciated for her look and fashion sense, Michelle openly supported American designers and became a fashion icon for many. Melania Trump – born Melania Knavs – was born in Novo Mesto, Slovenia, in 1970 and worked as a fashion model in Slovenia as well as in Milan and Paris before moving to the United States in 1996. In New York, Melania’s modelling career was associated with Trump Model Management and Irene Marie Models. She also launched her line of jewelry and of skin care products in 2010. Melania met Donald Trump in 1998 at a party hosted by Paolo Zampolli – co-owner of Metropolita Models – at the Kit Kat Club. While Trump had been separated from Marta Maples since May 1997, he attended Zampolli’s event with a date, but asked for Melania’s phone number anyways. Melania and Donald started dating shortly after and became engaged in 2004. They married on January 2005 in Palm Beach, Florida, and on March 2006 they had their son, Barron William Trump. Melania was never particularly involved in her husband’s business and played a relatively small role in Donald’s Presidential campaign. Unlike most First Ladies, she has rarely addressed the nation and has not been very vocal in expressing her support for Donald during the campaign and the presidency. Michelle Obama and Melania Trump are two very different women who served as 44th and 45th First Ladies of the United States. 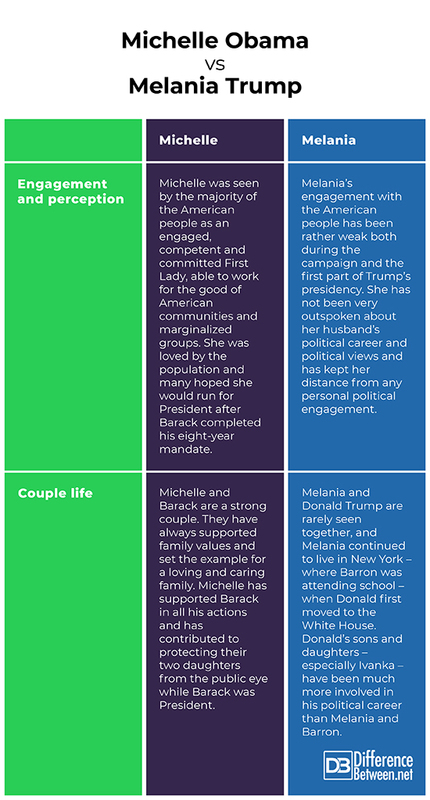 Their personalities and attitude towards the world of politics – as well as their engagement with the American people – are significantly different, but Michelle and Melania also share some similarities. Both are mothers: Michelle and Barack Obama have two daughters, while Melania and Donald Trump have one son, although Donald had other children from his previous marriages. What is the Difference between Michelle Obama and Melania Trump? While Michelle Obama has been by Barack’s side every step of the Presidential campaign and during his eight-year presidency, Melania has been less involved in Donald’s political activity. Michelle’s actions – and social engagement – as First Lady has rarely been contested, while Melania’s messages and actions have been under the American people’s scrutiny because of Donald Trump’s extreme and unconventional behaviors in many occasions. For instance, Melania’s messages in support of women’s rights have been labeled as hypocritical since her husband has been accused of having affairs and groping women. Despite both being (or having been) First Ladies, Melania and Michelle are very different people and have shown a different level of engagement with the American population. Both charming and powerful women, Michelle Obama and Melania Trump are the 44th and 45th First Ladies of the United States. Michelle married Barack Obama after having studied at Harvard Law School, while Melania pursued her career in fashion modelling before marrying Donald Trump. Michelle’s presence has been key throughout Barack’s presidency. She has focused on combating poverty, on promoting social equality and on trying to reduce the rate of obesity in the country. In addition, she has expressed her support to her husband and addressed the nation in more than one occasion. Conversely, Melania has been less involved in Donald’s political life and has rarely spoken to the American people. While Michelle was the first African-American First Lady, Melania is the first naturalized US citizen to become a First Lady. Michelle was loved and trusted by most Americans, to the point that many hoped she would run for President after the end of Obama’s mandate. Conversely, Melania has not been significantly involved in the American political scene and, at first, continued to live in New York even when Donald moved to the White House. Giulia Squadrin. "Difference Between Michelle Obama and Melania." DifferenceBetween.net. January 29, 2019 < http://www.differencebetween.net/miscellaneous/politics/difference-between-michelle-obama-and-melania/ >. Caroli, Betty. First Ladies: From Martha Washington to Michelle Obama. Oxford University Press, 2010. Kahl, Mary L. "First lady Michelle Obama: Advocate for strong families." Communication and Critical/Cultural Studies 6.3 (2009): 316-320. Trump, Donald J., and Meredith McIver. Trump: Think Like a Billionaire: everything you need to know about success, real estate, and Life. Random House, 2004.